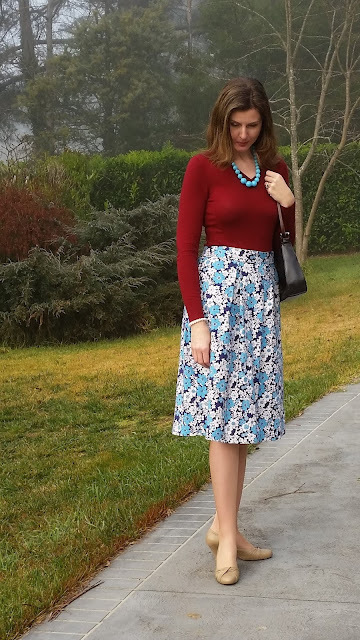 The Tall Mama: I Made It Monday - "Mabel Midi"
Welcome back to "I Made It Monday!" Today I'm wearing something which was half made by me, half made by my Great Grandmother 50 - 60 years ago! I was recently given sewing patterns and fabric which had belonged to my Great Grandmother Mabel. The oldest of the patterns is for a Nightgown from 1923! She would have brought this pattern with her when she migrated from Scotland to Australia. Great Grandma Mabel made everything herself using her peddle powered sewing machine; all of her clothes and even underwear! Amongst the fabric remnants was a skirt, with only the side seams sewn. I was told that she always wore dresses, so this would have been the bottom of the dress but sadly the top was nowhere to be found. As Mabel was a "sturdy" woman there was enough fabric to make a pleated midi skirt and cut some off the bottom to make into a waist band. It is so special to me to work on a piece started by my Great Grandmother. To think she had lovingly selected this fabric, washed and ironed it, then started to turn it into a garment long before I was born is remarkable. I used lots of hand sewing to be in keeping with how Mabel would have sewn. I did use my overlocker on one seam, telling myself that if Mabel had an overlocker she would have used it, but then I felt guilty as I wasn't preserving the vintage integrity of the piece so I finished the other side seam using just the sewing machine. Talk about over thinking a seam! I used a similar method to this to construct the skirt, but just made 2 box pleats in both the front and back. No, I'm not striking a fancy pose... I'm falling off my own feet! Photos c/o my wonderful Husband who catches me at my most awkward moments! 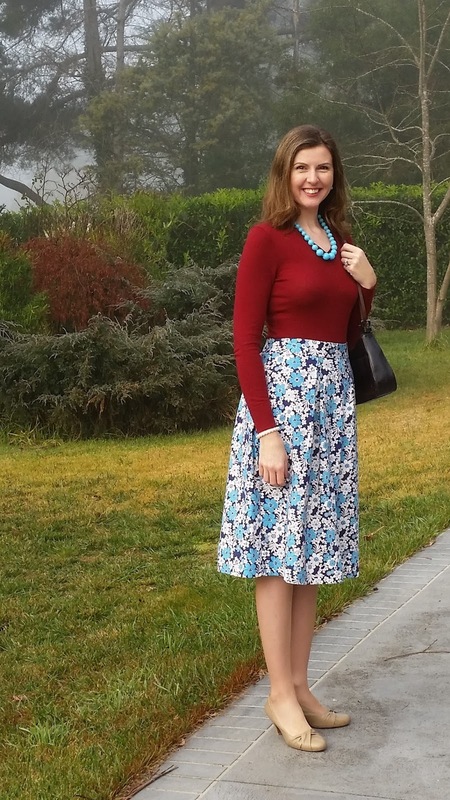 Needless to say this skirt has become an instant favourite which I've dubbed the "Mabel Midi"! So brace yourselves, you'll be seeing a lot of it! I can't wait to style it for summer! What a wonderful and interesting story behind this skirt. I really enjoyed reading it. Isn't it funny that fabric from so long ago is quite on-trend today? P.S. Your caption on your last photo had me giggling. Thank you Beth! 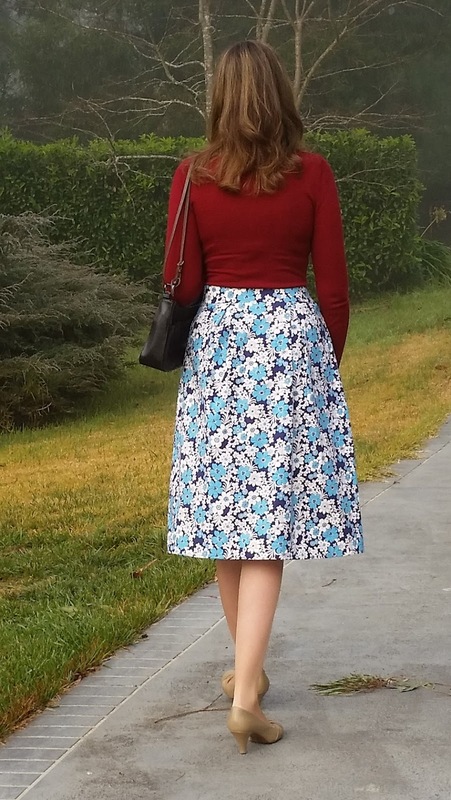 I'm so in love with this skirt, because of the look and the history behind it. I wish I was talented enough to do something like this. Such a beautiful story and skirt - I love the blue and rusty-red colour combination too. You can sew! It just takes practice, like learning any new skill. 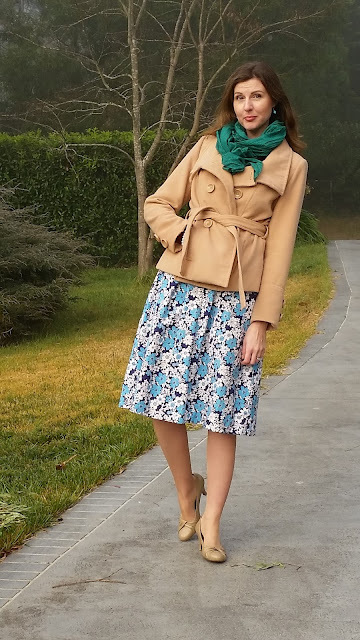 I'll be posting a really simple skirt tutorial soon which would be great to start with. My great grandmother was named Mabel too! She did love to sew and make clothes as well! What a lovely skirt that you can keep forever! Thank you Ruth! Amazing that you had a Mabel too, it's a perfect Great Grandma name!! That is a lovely skirt! I love the print so much! !